Habit: Biennial, perennial herb; taprooted, roots clustered, or rhizomes; generally glabrous, +- spiny. Stem: decumbent to erect, generally branched. Leaf: basal rosette, cauline; petioles present or 0; blades linear to triangular-ovate or round, generally pinnately or palmately lobed or dissected (entire), generally sharp-toothed or spine-tipped, net-veined; juvenile leaves linear, segmented. Inflorescence: heads 1--many in cymes, racemes [panicles]; bracts each generally subtend 1 flower, with scarious membrane enclosing ovary, outer > to >> inner, spiny or not on margins and abaxially; rays, pedicels 0. Flower: sepals spine-tipped, generally persistent; petals oblong to ovate or oblanceolate, white to blue or purple, tip long; anthers, styles generally green, occasionally blue; ovary tip projection 0. Fruit: obconic to obovate or narrowly elliptic [round], compressed or not, densely scaly; scales at fruit tip and along juncture of carpels generally larger, longer than on face or base; ribs 0; oil tubes obscure; fruit central axis not obvious. Seed: face generally flat. Species In Genus: +- 230 species: America, Eurasia, Australia, New Zealand. Etymology: (Ancient Greek name used by Theophrastus) Note: California species variable, intergrading, need study. Habit: Glabrous, or inflorescence short-stiff-hairy. Stem: erect, 1.5--5 dm, stout, main stem branched 7--32 cm distal to rosette. Leaf: petiole << blade, blade 10--30 cm, lanceolate, sharply pinnately lobed, lobes generally opposite, white, margins thickened. Inflorescence: heads 1.5--2 cm, spheric, in cymes; peduncle 0.2--1 cm; bracts 9--17 mm, lance-linear, margins, veins thickened, marginal spines 0. Flower: sepals 3.5--4 mm, entire, lanceolate; petals oblanceolate, white; styles 3.5--4 mm, generally = sepals. Fruit: 3--3.5 mm, narrow-elliptic; scales dense, unequal, lanceolate, acuminate. Chromosomes: 2n=32. 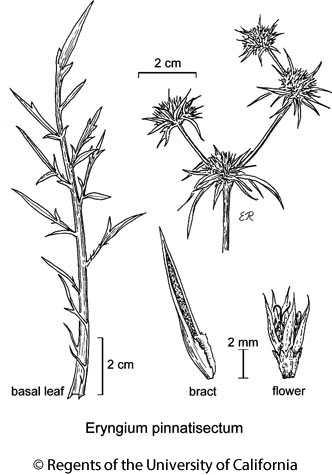 Citation for this treatment: Robert E. Preston, Michael S. Park & Lincoln Constance 2012, Eryngium pinnatisectum, in Jepson Flora Project (eds.) Jepson eFlora, http://ucjeps.berkeley.edu/eflora/eflora_display.php?tid=25094, accessed on April 26, 2019.
n&c SNF (Sacramento, Amador, Calaveras, Tuolumne cos.). Markers link to CCH specimen records. Yellow markers indicate records that may provide evidence for eFlora range revision or may have georeferencing or identification issues. Purple markers indicate specimens collected from a garden, greenhouse, or other non-wild location.